In the wake of World War II, the Allied forces charged twenty-eight Japanese men with crimes against humanity. Correspondents at the Tokyo trial thought the evidence fell most heavily on ten of the accused. In December 1948, five of these defendants were hanged, while four received sentences of life in prison. The tenth was a brilliant philosopher-patriot named Okawa Shumei. His story proved strangest of all. Okawa's guilt as a conspirator appeared straightforward. But on the first day of the Tokyo trial, he made headlines around the world by slapping star defendant and wartime prime minister Tojo Hideki on the head. Had Okawa lost his sanity? Or was he faking madness to avoid a grim punishment? 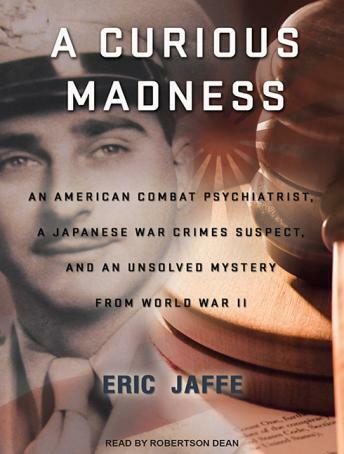 A U.S. Army psychiatrist stationed in occupied Japan, Major Daniel Jaffe-the author's grandfather-was assigned to determine Okawa's ability to stand trial, and thus his fate. Jaffe was no stranger to madness. He had seen it his whole life: in his mother, as a boy in Brooklyn; in soldiers, on the battlefields of Europe. Now his seasoned eye faced the ultimate test. If Jaffe deemed Okawa sane, the war crimes suspect might be hanged. But if Jaffe found Okawa insane, the philosopher patriot might escape justice for his role in promoting Japan's wartime aggression. Meticulously researched, A Curious Madness is both expansive in scope and vivid in detail. As the story pushes both Jaffe and Okawa toward their postwar confrontation, it explores such diverse topics as the roots of belligerent Japanese nationalism, the development of combat psychiatry during World War II, and the complex nature of postwar justice. Eric Jaffe is at his best in this suspenseful and engrossing historical narrative of the fateful intertwining of two men on different sides of the war and the world and the question of insanity.